Generally, summer means that time of the year when the sun is shining bright, the temperatures are soaring high and it is time to indulge in poolside activities while enjoying ice creams. But for people who have even the slightest of hints about Salesforce, summer means it is time for the release of new features. And, 2017 is no different. The Salesforce Summer ’17 Release has been making the news for quite some time now, and it will be officially available to everyone on June 9, 2017. In the spring this year, we saw Service Cloud updating their console and now it is time for the Sales Cloud to roll out the Lightning Sales Console. What this means is that you will get some enhanced features. Split view is the first of them, which looks pretty cool. It allows users to pull back in the List View without losing context to what they are working upon. Lightning voice is now going to be called Lightning dialer, which also comes with the ability to create call lists. You can quickly add an account, contact or other information to the contacts in this list and dial right out of Salesforce. Plus, it is going to come with pre-recorded voicemails. In spring 2017, Salesforce released the Einstein Insights Now you will be able to get the Insights displayed in the Einstein Alerts component. It will include three types of new insights. First one would be Anytime a Competitor is named, the second one is anytime an email mentions a contact and the third one would when an opportunity is leaving. In the all new Salesforce, you will be able to pop-out your email composer to the large screen. So, when you are trying to copy and paste email content you will be able to navigate around and look at the records without worrying about login the email. At the same time, you will be able to see the email signature and modify them if required as well. To make Salesforce more adept for people who live and die by the keyboards, the latest update is going to bring in keyboard shortcuts as well. You will be able to perform simple functions like Ctrl-C and Ctrl-V, and more. From editing or saving a record to closing it, creating a note, posting to a feed or even launching a search, you will be able to do it all now! The all new update is also going to bring in Content Hierarchy, which means that you will be able to customized contact field displays, pop-ups on hovering over the contents and lot more. With the space of storing more than 2000 contacts, Contact Hierarchy is surely going to be something that’s going to be a welcomed addition to the tool. Not last, but one of the most prominent features that you are going to get in Salesforce 2017 update, is the updates in Slick Path. You will now get it added to the Orders and Contracts, plus you can add tops and highlight the fields at each step. The UI has also been updated, so whenever you open a record the path details will be collapsed and you will not need to scroll to see additional details. 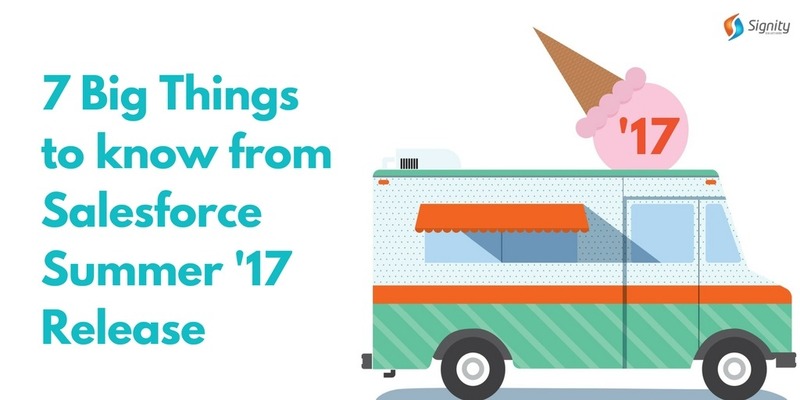 These were just a few of the powerful additions that you can expect to get in the coming Salesforce 2017 Summer Release. If you are looking for any assistance across Salesforce development, customization and Salesforce implementation in India, or anything else with your Salesforce instance, just drop us a line at sales@signitysolutions.com, and we will be happy to help.